…and the bugs. And the fungus. And the sun. And maybe a little bit of laziness too. I’ve worked hard on my garden this year, harder than I’ve ever worked on a garden in my life. It might not show to the outside world, because there is a long way to go still, but I have to admit that I feel the best I’ve ever felt about this particular garden. That is why it is a particularly cruel twist of fate that I am having more problems with it than I’ve ever had. Perhaps benign neglect truly is the best method after all. First off, I have aphids. 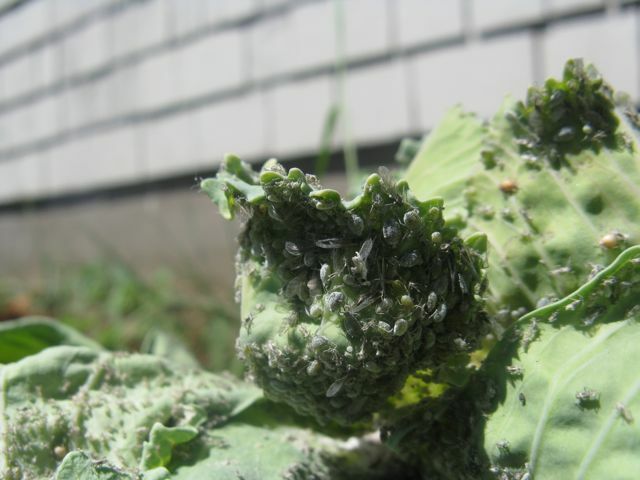 I have never in my life as a home gardener had aphids. As a professional horticulturist back in the day, I saw plenty of the teeny green bastards, but they have never invaded my home life until now, and I am pissed. 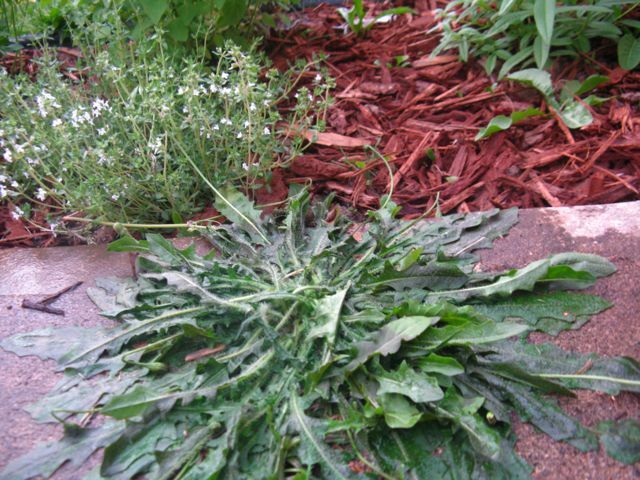 I first saw them on my Shasta daisies. Yes, I know Shastas are a magnet for them, but they are also my favorite flower. (Of course, I’d never grown them before and while I still love them, I have to admit that they are not worth all their unruly, floppy trouble.) I also saw some ladybugs, so I hoped that they would do their job and I left it alone. Days later, I noticed that they’d moved over to my hellebores. I started to get a little more concerned, but because they were still only hitting ornamentals, and my vegetables are way in the back yard, I did what any good organic gardener would do, and hit them with a powerful stream of water and hoped for the best. And then today, oh my goodness today, the saddest day. The bastards found my broccoli and my cabbage. I know what you’re saying, because I’m saying it too. How did it get so out of control??? I don’t know. I’m ashamed. Today was the first day I’ve really put some quality time in out in the veg patch, and I was mostly happy with what I found, but this was a total shock. This is my cabbage. One of the poor things was so overcome it just flopped down and died. I thought it wilted due to my 3 year olds ineffective watering, but it was the aphids, sucking out all its sweet cabbage bloods. This beautiful, apparently perfectly formed head of broccoli. My incredible child was so excited about this that she immediately started shoving florets into her mouth, barefoot in the midst of the garden. At which point I thought…oh God the aphids. Who knows how many she ate? Ugh. Barely on the leaves, they were concentrated deep in the florets, where you could barely see them, and where they are proving nearly impossible to remove. After several passes of individual florets under my kitchen sink sprayer, they are currently soaking in a bowl of cold water, but I have little hope. 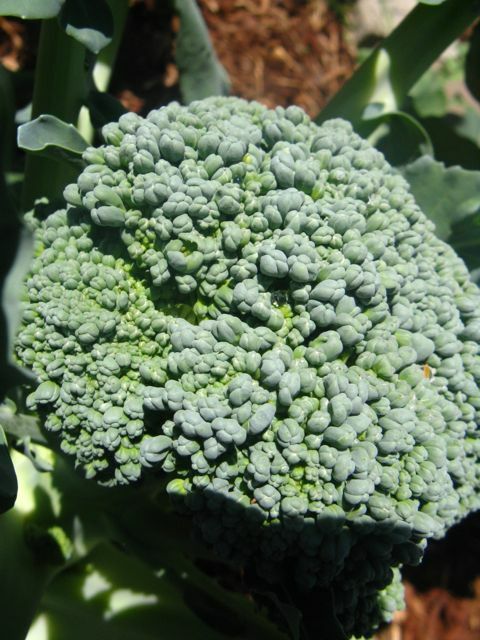 Honestly, if I can’t get all the aphids out I’m going to eat the damn things myself, because I grew this broccoli and I refuse to give it the chickens. …and the fungus. My very, very poorly espaliered apple trees (more on these someday, I am sure) have finally *FINALLY* put fruit on. I was ebullient when I discovered the petite little apples growing on one of the trees. At the beginning of the year, I had said, If they don’t give me some dang apples this year I am ripping them out of the ground. But I didn’t really want to. So, of course, bitter fate again, along with their tiny apples they’ve also developed powdery mildew. Thus far I’ve taken the extremely effective tactic of ignoring it, but it’s getting worse, so soon I’m going to have to pick off all the infected material and chuck it and see what happens. Obviously, I should have already done that, but that would not be my style. Again, lazy. I almost kind of sort of don’t want it to work though, because I’ve read that cow’s milk can treat it, and I think that would be kind of fun to experiment with. …and the sun. After a very long, wet, cold, dreary, downright interminable spring, it would appear that summer has finally decided to show up in Portland. I still have one foot in dreary and the sudden increase in watering needs has resulted in the death of my lovely hanging basket, my cheerful back porch Gerber daisies, two of the lettuces in my little mesclun pot, and the crippling of my nasturtium basket. You will be missed, friends. *My driveway, the driveway from hell, is covered in a thin layer of gravel over dirt. 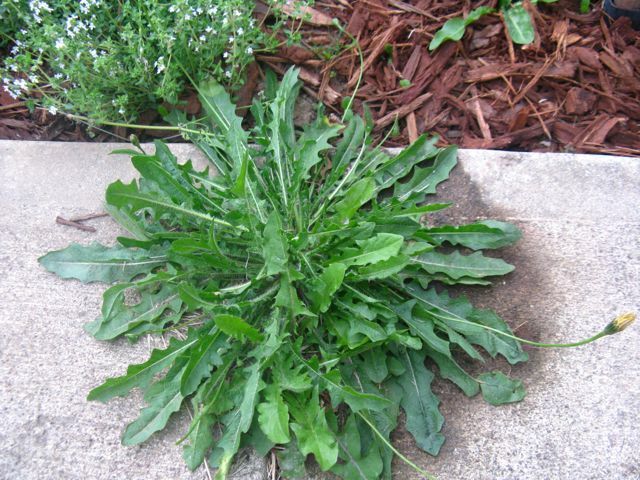 Thus, it is constantly besieged by weeds, too many weeds to handweed, and too annoying to hoe. Sometimes, honestly? I mow it. I have dreams of this lovely permeable driveway interplanted with fleur de lawn, but that’s a major project that I am not sure will ever happen. In the meantime, this year I decided to demolish the weeds with horticultural vinegar, and it worked, pretty well at least. I did it when the weeds were tall and I wasn’t able to get the roots of everything, but over the couple of weeks since I did it the driveway has started looking browner and browner. I mowed it last week and I am going to re-vinegar it, and I think I may finally tasty sweet tangy pickley success. *I also put down corn gluten after the vinegar, and I’m not seeing any new seedlings yet. That may be the corn gluten, or it may be that I’ve completely demolished the soil. More corn gluten experiments to come. Okay, so it hadn’t actually turned brown or crispy yet, but this was literally seconds after I scalded it, and I am willing to bet that by tomorrow it will be a crumbly delight. 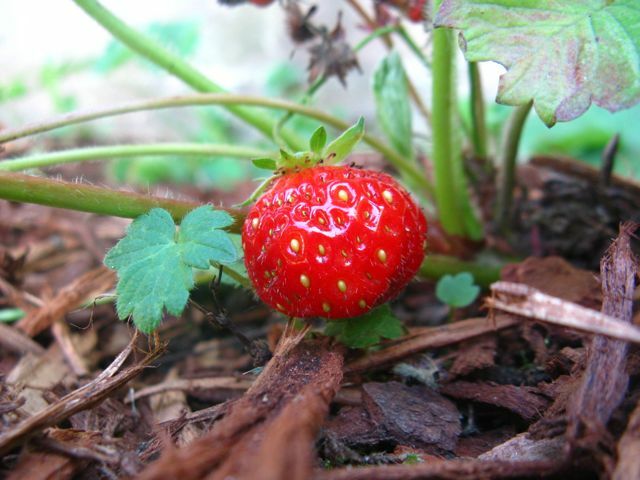 Finally, just because, my beautiful first ripe strawberry – saved so that Hazel could discover, pick and eat it herself. Pure 3 year old joy.